Edwards Lifesciences is a global leader in patient-focused medical innovations for structural heart disease, as well as critical care and surgical monitoring. Speakers include CEO Mike Mussallem, CVP Catherine Szyman, and CFO Scott Ullem and the visit includes a tour of the manufacturing facilities. Register now through the HBSAOC website! Harvard Club members will be given the Partner club rate. Edwards Lifesciences is the global leader in patient-focused medical innovations for structural heart disease, as well as critical care and surgical monitoring. Driven by a passion to help patients, the company collaborates with the world's leading clinicians and researchers to address unmet healthcare needs, working to improve patient outcomes and enhance lives. Edwards has established its position as a global leader with the introduction of lifesaving and life-sustaining therapies such as transcatheter aortic valve replacement, rapid-deployment surgical heart valve replacement and non-invasive hemodynamic monitoring. With nearly 60 years of experience, Edwards has grown into a global company, with a presence in approximately 100 countries and with nearly 12,000 employees around the world. Through our Every Heartbeat Matters initiative, we have directly helped more than 400,000 underserved people to date and are energized by the power of our community partners to reach our goal of helping 1 million underserved people by 2020. 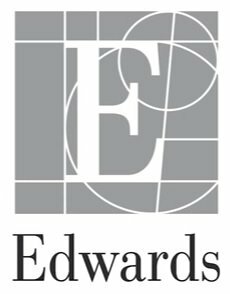 Edwards was recognized among the World’s Most Ethical Companies by the Ethisphere Institute, an organization that defines and advances standards of ethical business practices. Please join us October 26 at Edwards Lifesciences to gain firsthand insights from CEO Mike Mussallem, CVP Catherine Szyman, and CFO Scott Ullem on Edwards Lifesciences’ focused innovation strategy, patients-first culture, and much more including a fascinating tour of the manufacturing facilities. Michael A. Mussallem has been chairman and chief executive officer since 2000 when the company spun-off from Baxter International. Prior to his current position, Mussallem held a variety of positions at Baxter from 1979 until 2000 with increasing responsibility in engineering, product development and general management. Currently, Mussallem serves on the boards and executive committees of the Advanced Medical Technology Association (AdvaMed) and the Healthcare Leadership Council. He is an advisory board member for the Leonard D. Schaeffer Center for Health Policy & Economics at the University of Southern California and a trustee of the University of California, Irvine Foundation. Mussallem is the former chairman of the board of directors of both AdvaMed and the California Healthcare Institute (CHI). Mussallem received a bachelor's degree in chemical engineering and also an honorary doctorate degree from the Rose-Hulman Institute of Technology in Terre Haute, Indiana. Catherine M. Szyman has been corporate vice president since 2015 and is currently responsible for the company’s global critical care and vascular business. Prior to joining Edwards, Szyman held a variety of roles with increasing levels of responsibility for more than 20 years at Medtronic. She served as president of Medtronic’s global diabetes business for five years, overseeing research, development, operations, and sales and marketing. She also served as senior vice president of global channel management and corporate strategy and innovation, VP and general manager of endovascular innovations, and VP of finance for the vascular business. Szyman currently serves on the board of Endotronix. She previously served on the boards of Tornier, Inspire Medical Systems and the California Healthcare Institute (CHI). She graduated from the University of St. Thomas and earned her master’s degree in business administration from Harvard Business School. Scott B. Ullem has been corporate vice president, chief financial officer since January 2014. Prior to joining Edwards, he was the chief financial officer of Bemis Company, a global supplier of packaging used in leading food, consumer and healthcare products. Ullem also had leadership responsibility for one of Bemis' three business segments and the company's information technology function. Before joining Bemis, Ullem spent 17 years in global investment banking, serving as managing director at Goldman Sachs and later for Bank of America. He serves on the board of directors for Berry Global, Inc. and is a Henry Crown Fellow at the Aspen Institute. Ullem received a bachelor's degree in political science from DePauw University and a master's degree in business administration from Harvard Business School.